Have you started blogging yet? Make Search Engines And Visitors Fall In Love"
logs are everywhere. You can publish your articles, newsletters, catalogs and what not with blogs. 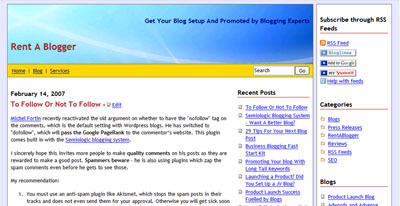 In fact, complete web sites can be built around the blogs. Get lots of targeted visitors to read your posts and improve branding of your site, send pre-sold visitors to merchant sites, give tips, increase consumption of your products and lots more. May be simply invite comments and get feedback. The possibilities are endless. Setting up a blog and customizing it is quite tricky. You have to bother about PHP and ASP. Dabble with databases. Design the blog to portray a personality and matches your primary site. Then blogs are to be fed regularly. Once you setup your blog, you should post regularly to this blog or it will grow stale and people will stop visiting your blog. Where in the world do you get the time to update the blogs? Is there any time left after managing your regular business? Setup your blog with a distinct personality in accordance with your site design. Update your blog based on matter provided by you or even research the topic on the Internet and come up with fresh and useful stuff ourselves. Submit your blog to the popular blog directories so that people looking for your topic will be able to locate you and read what you have to say. Imagine the time-savings and extra business that you are going to get after you have got a blog and RSS feeds set up for your sites. And now you can get it done at a minimal investment without getting bogged down. What next? How to proceed? It is easy. Just tell us about your requirements and I will get back with a no-obligation proposal as soon as possible. Remember that you have NO compulsion to order if you ask for more details. And we respect your privacy. You will only hear from us about things that you asked for. When Denis at the Semiologic Blog software company told me that you did a lot of their blog site set up and customization work, I knew I was in great hands to get my blog site up the way I wanted it to appear and function. I'm aware of your well-established programming and SEO background and it came in quite handy on my blog customization project. Working with you was great as you helped me realize each option that I wanted in my blog saving me much valuable time and effort. Now I can go in and manage everything on my own because of your excellent blog set up skills. I highly recommend your services to anyone who wants to get their blog set up quickly and efficiently. Copyright © 2005-2016 Ebizindia - the website marketing company. All rights reserved.